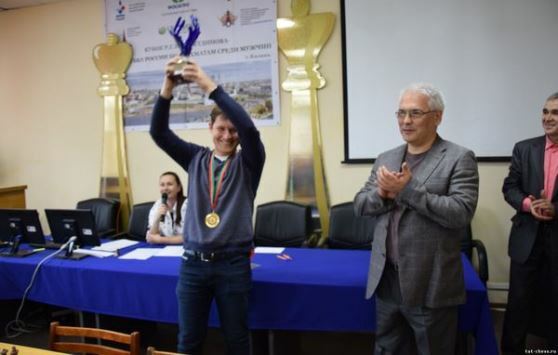 The final tournament of the Tatarstan Chess Federation Cup took place on May 14-15 at the Nezhmetdinov Chess Club in Kazan. 16 players competed in mixed format. First, two groups with eight players were held. Top four players from each proceeded to the knock-out section. The defending champion Gata Kamsky was unable to repeat his success. Grandmaster Artyom Timofeev won the event, IM Azat Sharafiev was a runner-up, FM Ramil Faizrakhmanov finished third. The total prize fund was 160,000 RUB. WGM Vera Nebolsina from Novosibirsk won the women’s section, candidate master Dmitry Ioffe prevailed in the senior section, FM Bulat Murtazin won the junior section. FM Anton Isaevsky won the Sputnik Open, which was held simultaneously with the main event.